Marvel's much anticipated 'Avengers: Infinity War' has finally arrived and has already leveled the box office with a snap of Thanos' fingers. The much alluded-to confrontation between the Avengers and the Mad Titan who relentlessly seeks out the six Infinity stones in order to harness their power to lay waste to the universe is a near-three-hour brawl that mostly entertains, shocks, and destroys fans emotions. It was predestined to be a blockbuster film on the heels of another Marvel triumph, Ryan Coogler's 'Black Panther. 'That film rewrote the record books for virtually every category and more importantly shattered the myth that a mostly black production can't sell across demographics and borders. Excitement for Marvel and action movie fans couldn't be any higher when 'Infinity War' was released just two months later. Marvel's ascension to the top of the box office charts is the envy of studios all over Hollywood. A formidable track record of hits that is unheard of outside its Disney sibling, Lucasfilm, and the Star Wars franchise. Even Marvel Studios' more mediocre fare become hits regardless. It's staying power like that that has seen the comic book movie studio generate billions of dollars worldwide for Disney. The House of Mouse's $4 billion purchase price has paid off and seems like a bargain in retrospect. All it took to get to this level of success was a vision and a plan. A plan executed by producer and president of Marvel Studios Kevin Feige. The Marvel Cinematic Universe (MCU) was born and brought forth in phases. Each new entry in each phase typically gives birth to its own franchise. In 2008, Iron Man launched Phase One, built on an obscure C-level hero at the time and the smirk and charm of Robert Downey, Jr. Its huge success begat the smaller success of The Incredible Hulk (2008) and the MCU was off and running. Iron Man 2 (2010), Thor (2011) Captain America: The First Avenger (2011), and Marvel's The Avengers (2012) introduced moviegoers to the core team and an interconnected movie universe with shared continuity. 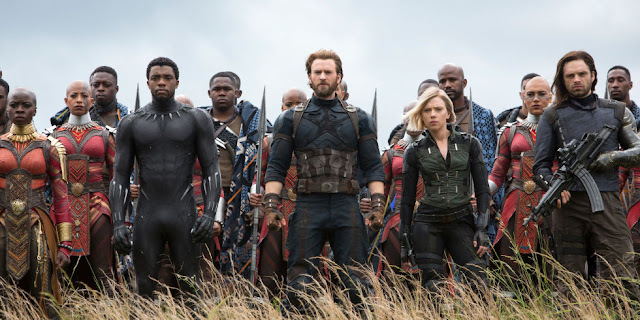 By the time these iconic Marvel comic book heroes - Thor, Iron Man, Hulk, Captain America, Black Widow, Hawkeye, and Nick Fury - crossed over in The Avengers, Marvel Studios had cemented their place as a Hollywood heavyweight with a system for success that kept on paying dividends. The individual storylines of the solo films impact each other until they converge in the final team films of each phase. Phase Two saw Iron Man 3 (2013), Thor: The Dark World (2013), Captain America: The Winter Soldier (2014), Guardians of the Galaxy (2014), give way to another team-up adventure in Avengers: Age of Ultron (2015). This time the phase was closed out with the introduction of Ant-Man (2015). The pattern was set, building up franchises while introducing new heroes sometimes in mid-credits scenes, until they collide in one big epic film. This leads us to Phase Three. Having produced all the films in the MCU, Feige changed the template with an opening team-up in Captain America: Civil War (2016). The Avengers become fractured as a proposed government-mandated superhero registry reveals some hardened philosophical differences. This pits Captain America against Iron Man, eventually forcing heroes to pick a side and ultimately fighting one another in an airport. The film introduces Tom Holland as Peter Parker / Spider-Man and Chadwick Boseman as T'Challa / Black Panther to the MCU, who appear in solo films in 2017 and 2018, respectively. The fallout of Civil War is significant because it permeates throughout the phase until it reaches Infinity War. The team is spread out gone their own way or on house arrest. Tony mentors Peter in Spider-Man: Homecoming (2017), Doctor Strange (2016) appears in his solo film, Thor: Ragnarok (2017) and Black Panther (2018) represent a culture change at Marvel in who gets to direct their films. Taika Waititi made Thor relevant again by appealing to the characters' more colorful origins with a sense of adventure and comedy. Coogler personalized the Black Panther story making it timely, subversively political, inspiring, inclusive, thrilling, and unapologetically black. The first men of color to direct MCU movies are opening new opportunities for even more representation 10 years after Iron Man. Infinity War brings most of these characters to the table against the villain who's been in the background biding his time until he's forced to find the Infinity Stones himself with help from his "children" the Black Order. Directors Anthony and Joe Russo (Captain America: The Winter Soldier, Captain America: Civil War) set the tone early demonstrating that Thanos and his brood mean business and that no good-guy is safe. This is not a movie you can fully experience without having watched at least some of the 18 movies prior to this one. Characters will be pop up and talk about events and battles that have occurred that without having seen Guardians of the Galaxy, Doctor Strange, Black Panther, Thor: Ragnarok to name a few would confuse even the most prestigious film critic. Avid and casual Marvel movie fans are rewarded here with the return of old characters fighting together planning together and the stakes at risk are different for each of them. Thanos is Gamora's "father" so she's forever linked to him, for Tony, Thanos ordered the attack on New York, but most of all, the Avengers hold some of the Infinity Stones he needs and nothing will stop him from getting them. That puts Vision in danger for the Mind Stone on his forehead, Doctor Strange was chosen to guard the Time Stone in his Eye of Agomoto pendant, and Thor has the Space Stone within the Tesseract that Loki retrieved at the end of Thor: Ragnarok. So obviously, the Avengers have a target on their back when the motivated Thanos comes a-calling. The culmination of all those storylines come into play here in a much more satisfying way than when these characters shared the screen in Civil War. As exciting and fun as that film was, it was just an excuse to pit the Avengers against one another in one extravagant pillow fight while introducing Spider-Man and Black Panther. The real meaningful conflict rested between Cap and Tony. The residual effect of that brutal fight is touched upon here as the threat of destruction forces them together again. It's a testament to Feige's adherence to a connected universe that the public has an investment in what happens to these heroes when they're faced with a game-changing menace. The threat feels more imminent and real, not the benign villain Marvel usually delivers. It doesn't hurt that comic book fans know from the source material that heroes do die so the prospect of losing one of their favorites is possible and nervewracking. This is the benefit of having witnessed these characters' arcs across one or two movies, the knowledge of how they're all connected, and what they've endured to this point. At its heart, the Marvel Cinematic Universe is as much a relationship with its audience as the characters are to themselves. It's a shared experience with shared memories of events that took place over multiple movies through the last ten years. 'Infinity War' cashes in on those familial ties entrusting the fans that they'll understand all the nuances and easter eggs on the screen that have been ten years in the making. It's almost a communal experience that drives the frenzy of fans the world over awaiting the next cinematic adventure, one that is finally embracing more diversity in front and behind the camera. Marvel's box office dominance seems primed to continue more inclusive and epic as ever.